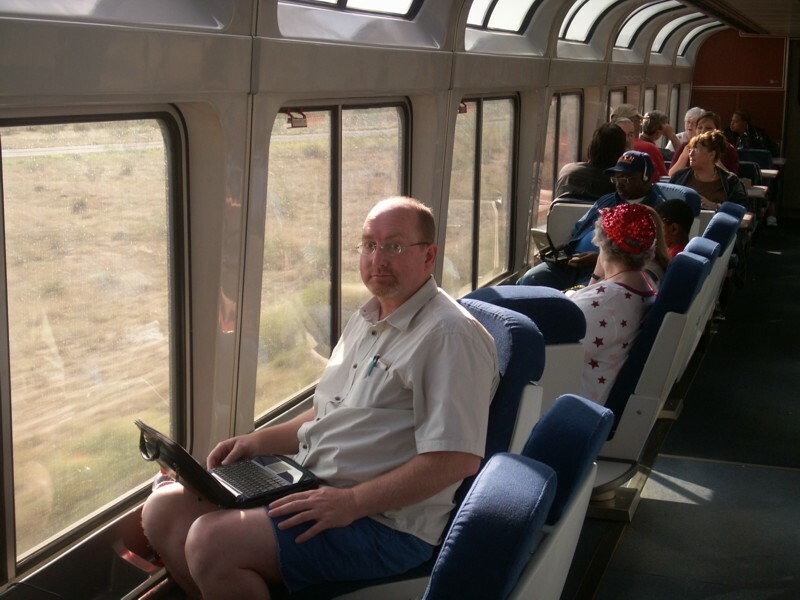 Our experience indicates that Amtrak trains are usually late. Amtrak personnel explain that freight trains have the right-of-way to the tracks that Amtrak only leases, so there are always unscheduled delays as freight schedules shift. Some slack is built into the Amtrak schedule to allow for this freight delays. 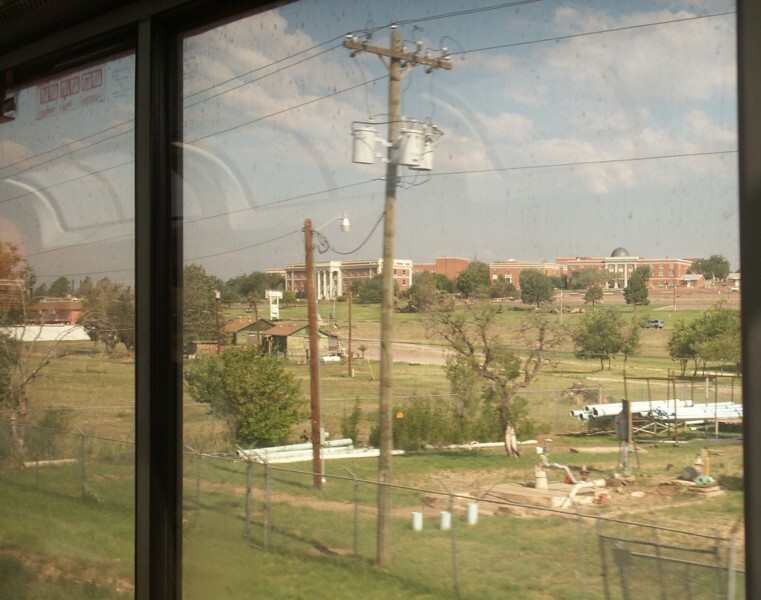 However, there are other sources of delay: on a trip from Chicago to Houston, the train stopped while a tree, blown over during a storm in the night, was removed from the track. Then the freight trains that had been blocked were allowed to move on out first. On another trip we had to wait four hours while a freight engine and engineer were brought in to replace an Amtrak engine that failed. However, I've never had to spend a night in a motel waiting for the train to get started again as I once did on a 500 mile flight from Houston to Little Rock. The airline personnel, who were already leaving their stations at the Dallas terminal, explained that the flight had been canceled because of a “mechanical” problem. 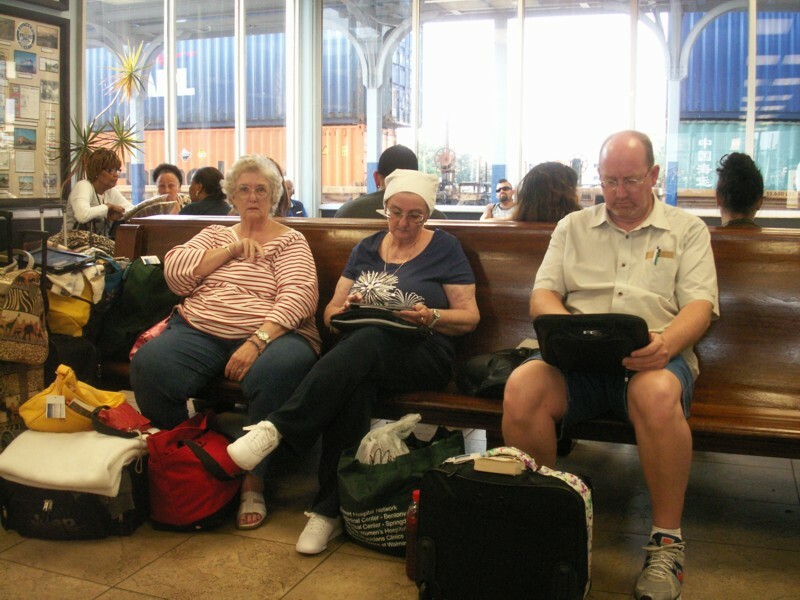 So these first photos show us waiting for the train at the Houston Amtrak Station. 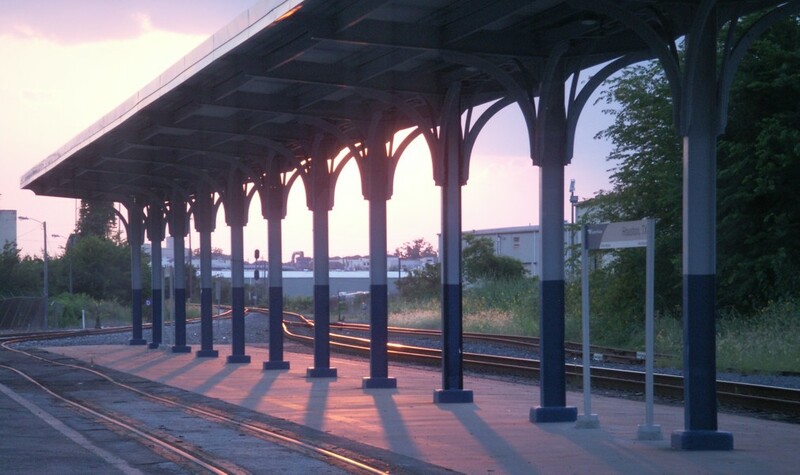 The Sunset Limited originates in New Orleans and the trains usually leave on time. I don't know how they lost so much time in the short distance from New Orleans to Houston. The train has an overnight stay in New Orleans and that should give plenty of time to get it ready to start west. 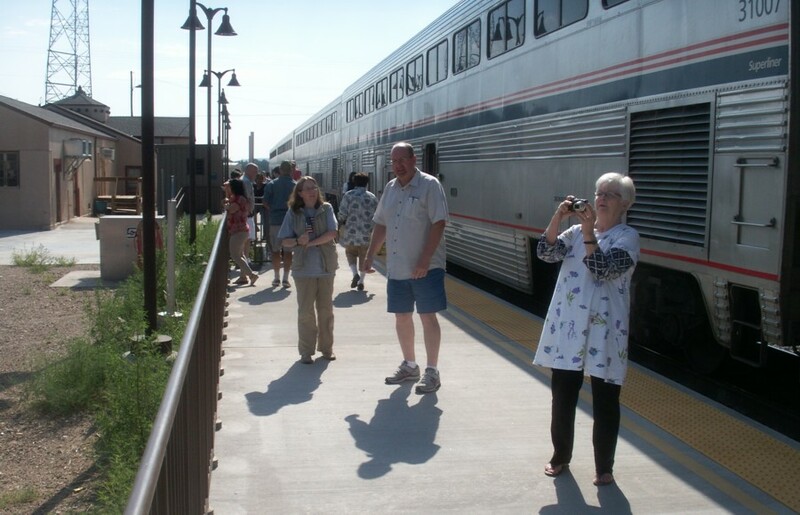 On the other hand, the Southwest Chief from Chicago to L.A. turns back to Chicago the same day it arrives in L.A. Our train was late arriving in L.A. and was late returning to the station that evening to pick us up. However, Amtrak personnel had everyone ready to board quickly and we were on our way without much delay. 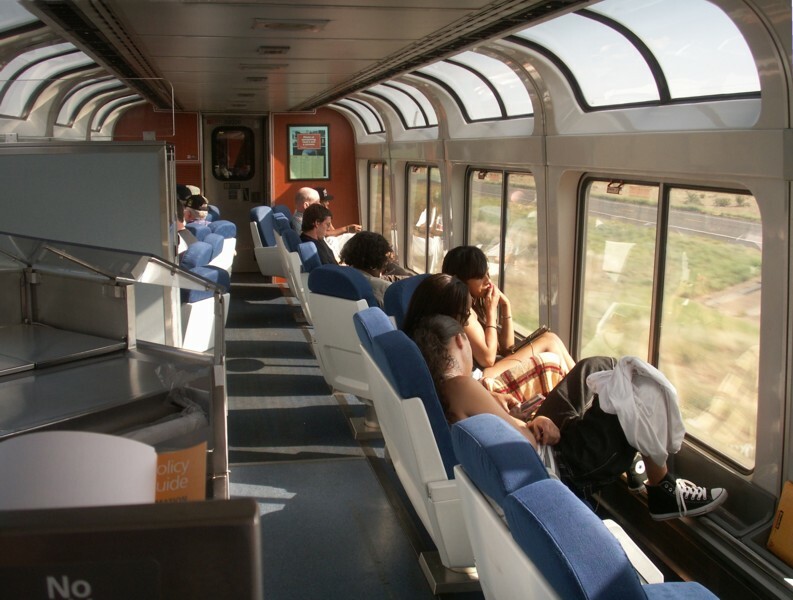 The Sunset Limited used to originate in Jacksonville, Florida, on the Atlantic coast. At least I think I've read that. Anyway, I've read that on of those big hurricanes along the Gulf Coast in the Missippi/Alabama area destroyed the bridges along the coast and they've never repaired the bridge that carried the railroad Amtrak was using. We waited and waited in the waiting room. 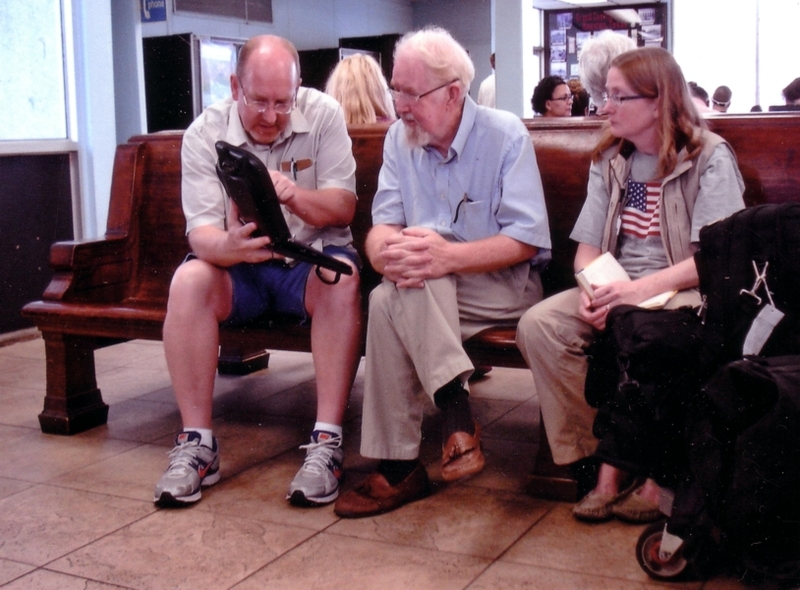 Here are Ann, Frances, and Louis on one of the classic depot benches. A freight train is visible on the tracks behind the station. 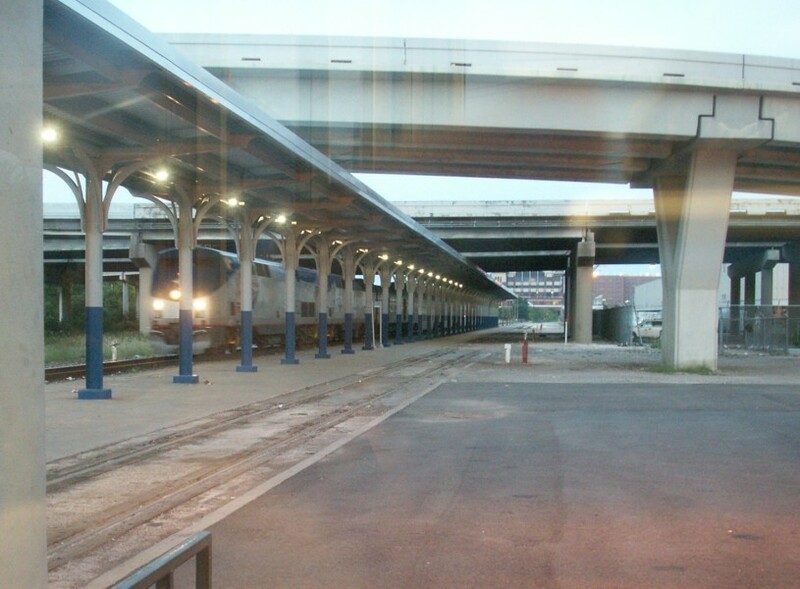 We knew that it would have to move on down the line (east) far enough to allow the Amtrak train get around it and come on to the Houston station. The train was scheduled to arrive at 6:30 p.m. Here it is, arriving at 8:30. They had us lined up and ready to go, so we boarded and were on our way quickly. By the time we moved out it was too dark to see much and soon we were snuggled up in our recliners for the night. We got to San Antonia after 7:00 a.m. but it was still dark. 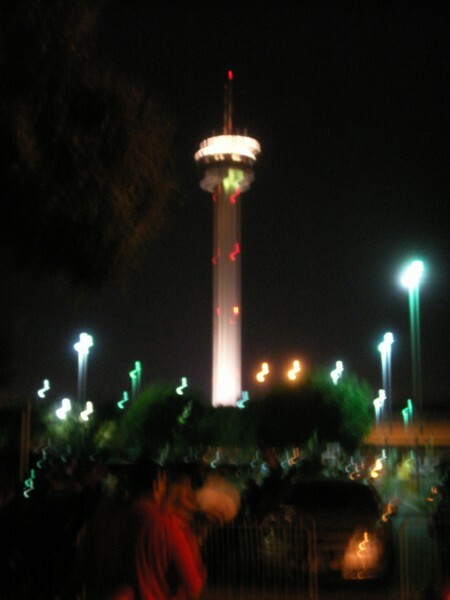 This photo shows the Hemisfair Tower at night. The sun was soon up, and it was time for breakfast. 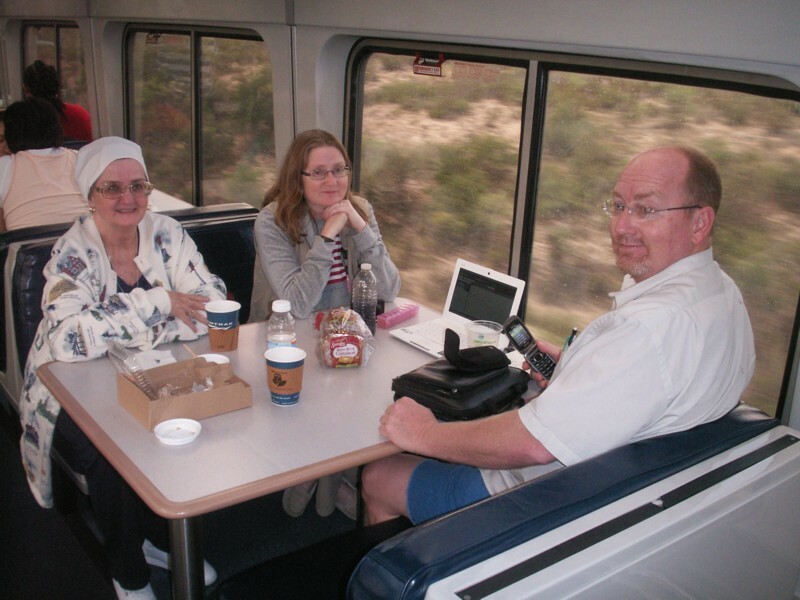 Frances, Becky, and Louis went to the cafe snack bar on the lower level of the observation car. Since Ann and I had rented a sleeper berth for this part of the trip, we had the prepaid meals in the dining car. I think I just had coffee here in the snack bar. This is the little town of Sanderson east of Alpine. 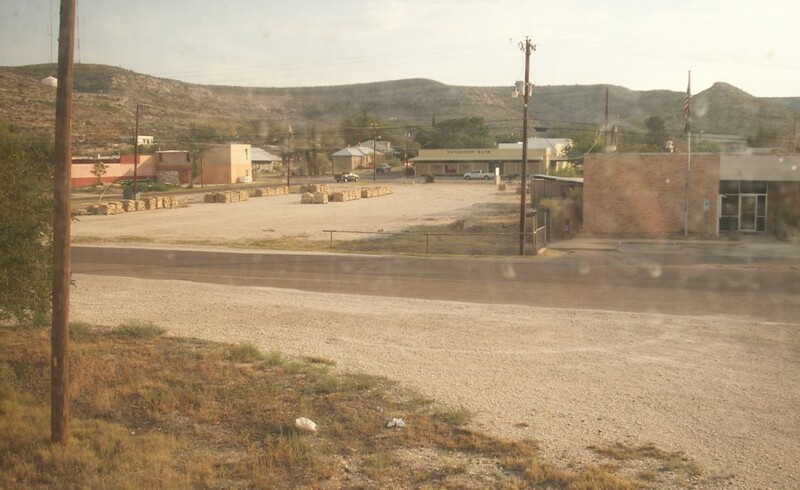 It's a good example of what those dusty southwest Texas towns look like. We had already been by Langtry. The railroad followed U.S. 90 for much of the trip. The Sanderson Bank building is in the center of the photo. The view forward in the observation car. Some of the pedestal chairs would swivel. Electrical power connections were available in all the passenger cars. Then there is a photo looking toward the back with Louis, Ann, Frances, and Becky beside Ann. The table booths were in the back. This group of ranch buildings was just outside Alpine. 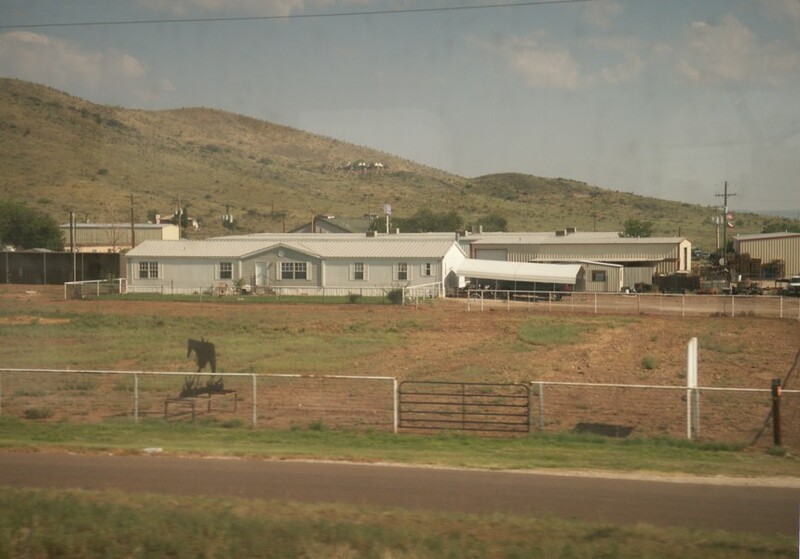 Sul Ross State University in Alpine, Texas, as viewed from the train. It is located across U.S. 67/U.S. 90 from the railroad. U.S. 67 is a long and winding road reaching 1,560 miles from Sabula, Iowa, to Presidio, Texas. It continues into Mexico as Mexican Federal Highway 16. U.S. 67 goes through St. Louis, Missouri; Little Rock, Arkansas; and Dallas, Texas, along the way. I drove it many times from Little Rock to Texarkana before I 30 was completed. I still drive on it from time to time at Maud, Texas. Here is a very 'busy' sign on the side of a building near the Alpine train depot. It's a good reference for things you might want to participate in during your next visit to Alpine. It's a nice place. Louis, Becky, and I got out at Alpine to walk and look around. 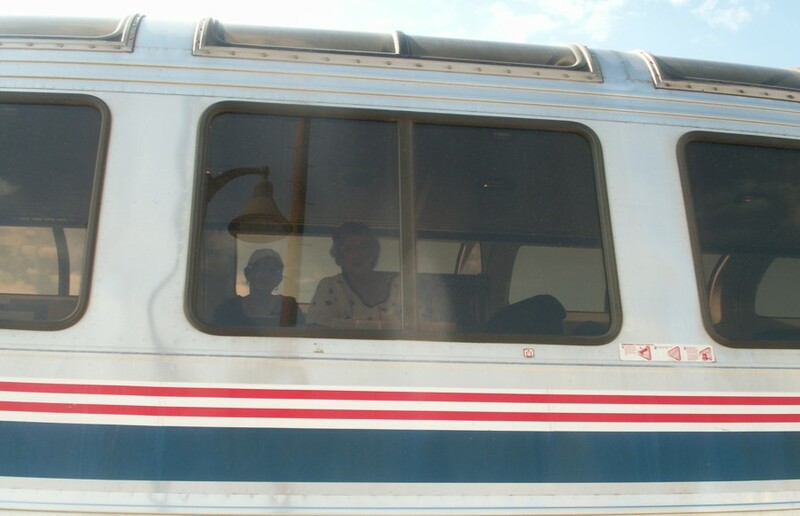 Ann and Francy stayed in the observation car. We walked along the train looking around and taking pictures. This is the view of the front of the train. That might be a 'sleeper' car or perhaps the dining car on the left, then a power car and two engines. 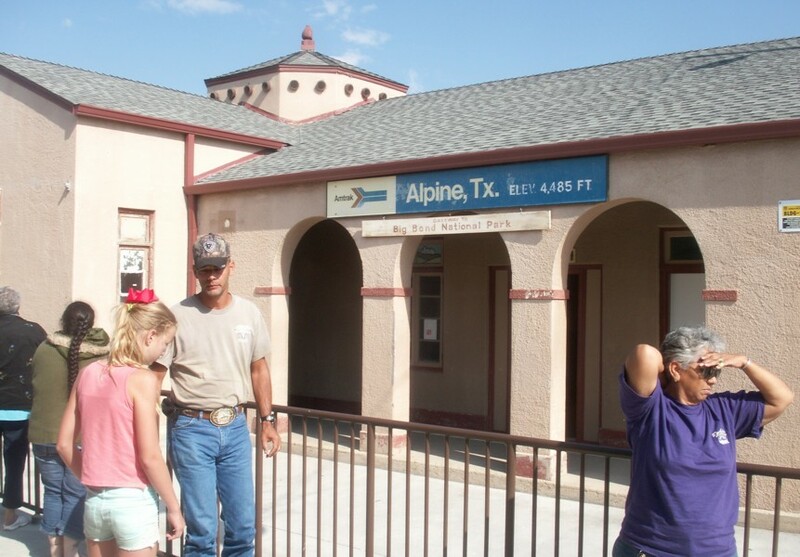 The Train Depot at Alpine, Texas. The Courthouse in Alpine, Texas. 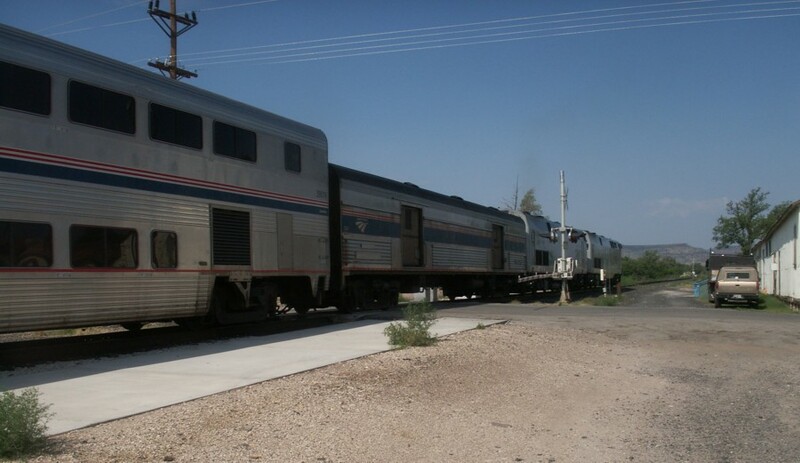 The train pulled out of Alpine at about 10:30 and an hour later we were still in the middle of the west Texas desert. By that point we were following U.S. 90; U.S. 67 having branched off toward Presidio. Then off to the northeast we saw a very long train of container cars. 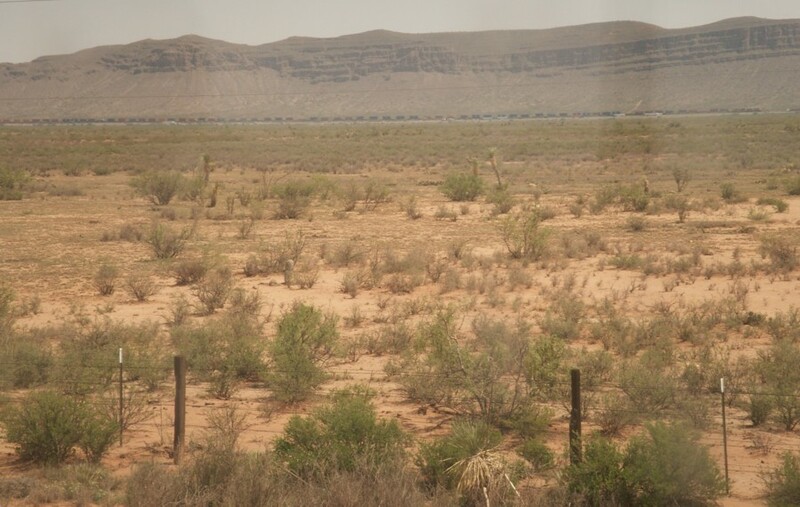 Page 1 - Amtrak Train - Houston to El Paso - Houston Amtrak station, Amtrak train, Alpine photos, and others. Page 2 - Travel - El Paso to L.A. to El Paso - Photos from the stops at El Paso and Tucson with other views along the way to L.A. Page 3 - Union Station Area - Photos of Union Station and neighborhood. 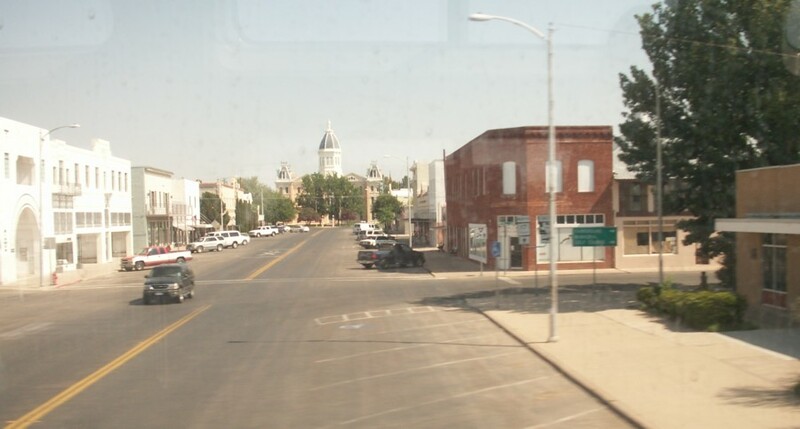 Page 4 - Williams, Arizona - The town of Williams, Arizona, claims that it was the last town on old U.S. Route 66 to be bypassed by Interstate Highway 40. It is the railroad gateway to Grand Canyon Nation Park. Page 5 - Train to El Paso - (PAGE NOT COMPLETE) Hos. Page 6 - Bright Angel Trail - The Bright Angel Trail is one of the big adventures of the Grand Canyon. It is about 7.7 miles from rim to river with a drop of 4,460 feet. We didn't hike that far, but we got several nice photos. 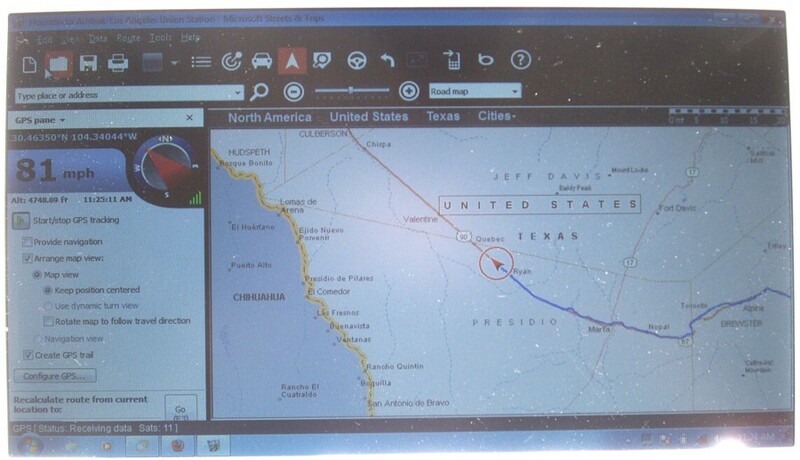 Page 7 - Train to El Paso - (PAGE NOT COMPLETE) . Page 8 - Hiking the Rim Trail - Louis and I hiked from Hermit's Rest to Powell Point. Page 9 - Hiking the Rim Trail - Louis, Becky, and I hiked from the Abyss to Mohave Point.